We’ve been playing a lot of New Super Mario Bros. U Deluxe lately. Even though it’s a port and I’ve probably talked about this before, I thought I’d go over some of my favorite worlds from the game. I have to admit, desert areas were never my favorite kind of levels. However, seeing the various desert areas on the Switch is really great. I enjoyed the graphics and the vividness of the scorching sun on the land. Same as the desert levels, I’m not a fan of water levels. I always hating the swimming mechanics in games. I was never able to control them well. Mix in the fish and other water enemies and I lose quite a bit of lives. However, water levels are always one of the most beautiful areas in the game. Especially when it’s on the Switch and the colors are as bright as a game such as New Super Mario Bros. U Deluxe. The waters truly are sparkling and the waves and bubbles are so cool to look at and watch. Ice levels have always been pretty, there’s no doubt about that. However, with this particular area in the latest Switch game, Frosted Glacier really stands up and takes the crown. Even though this list is in no particular order, I think I have to say this is my absolutely favorite. I loved the way the night starry skies glistened in the back ground and the shimmering ice on the ground added a certain flair to the level. Overall, it was just really well done. Honestly, I could put every world on this list. But, if I’m going to narrow it down and just focus on the levels that I absolutely love to look at the most, these three worlds definitely take it. 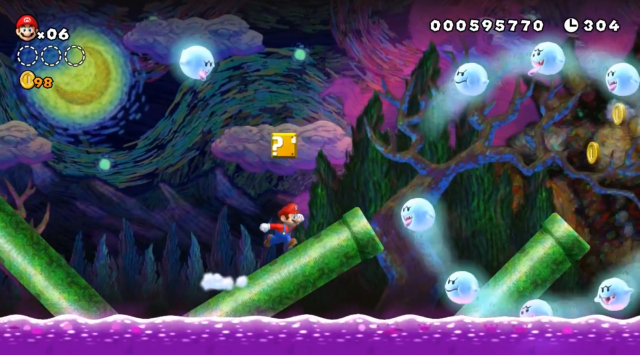 Have you played New Super Mario Bros. U Deluxe yet? What are some of your favorite worlds or levels? Let me know in the comments below and if you liked this post, please share it around! The Van Gogh level was the standout for me. So different from everything else in the game. Yes! This one is totally great. Frosted glacier and Soda Jungle are probably my favorites, although I hate the Boos! The boos are annoying, but I do love them. Boo is one of my favorite characters so I’m just biased, lol.